The mildly alkaline formulation means that Spritzer Concentrated Foaming Citrus Pre Cleaner does not degrade wax or protective layers and can be used on all vehicle surfaces. You could spend hours protecting your vehicle with wax and then accidently remove it all during a regular maintenance wash because you’ve used the wrong products. To stop this from happening, we at AutoGlanz have created Spritzer. Spritzer is a concentrated, mildly alkaline and non-caustic foaming prewash with a lovely natural citrusy scent. The mildly alkaline formulation means that Spritzer Concentrated Foaming Citrus Pre Cleaner does not degrade wax or protective layers and can be used on all vehicle surfaces. 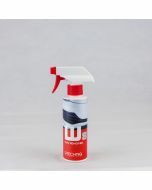 The added foaming properties ensures that all contaminants on the vehicle are lifted and safely removed from the surface before you make direct contact during your wash routine and therefore reduce the risk of causing any damage to the vehicle. Spritzer can be diluted up to 250:1 with water and has the ability to be used through either a dedicated foam lance or a kwazar foam sprayer for those who do not have access to a foaming lance. A benefit of Spritzer is that it has higher cleaning capabilities than a regular Snowfoam, however it has a much shorter dwell time, leaving you more time to concentrate on other parts of your routine. Spritzer can be used as a direct replacement for a snowfoam if desired, it is extremely effective where a stronger pre cleaner is needed without the risk of damaging or degrading any wax layers applied, Spritzer stands out from the crowd especially in winter months. Spritzer is an extremely versatile cleaner, it can be used for conventional spot cleaner in the same way as other citrus pre cleaners, as a direct replacement to snowfoam in either a dedicated foaming lance or kwazar style sprayer or even as standalone cleaner for all of those hard to reach areas.